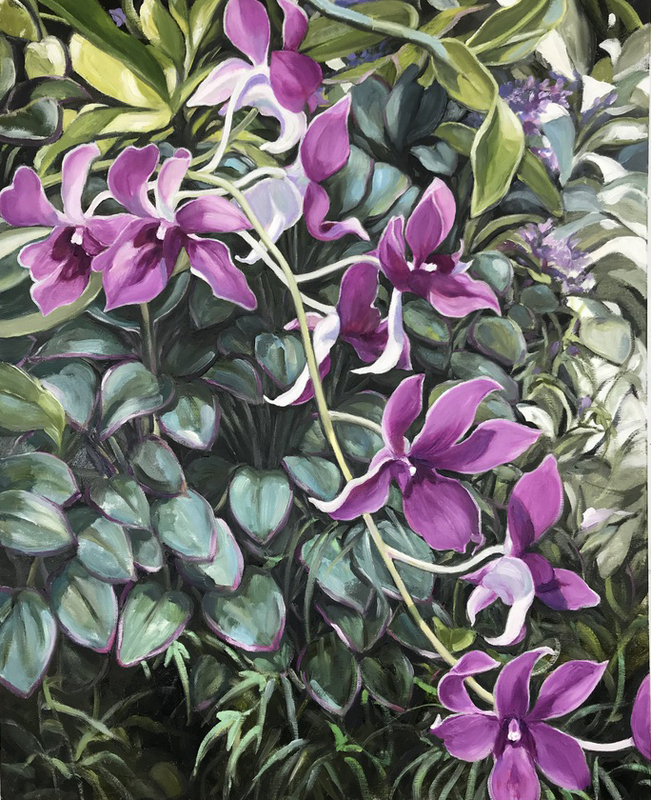 “Connections: New Art by Brooks Koff, Michael Van Hout, and Virginia Wright-Frierson” features three artists from Art in Bloom Gallery’s stable of artists. These Wilmington based artists have collaborated together on many projects and are bringing new work to the gallery walls. The artwork will range from beautifully rendered paintings, to stained-glass mosaics, to incredibly detailed tie-wire sculpture. Click here to view the work in the exhibit. Enjoy the Fine Art of Dining! View our current exhibits at our Satellite Venues. Dine at Pinpoint Restaurant to view the new installation of “The Joy of Plein Air: Pastels by Laurie Greenbaum Beitch” as part of our partnership with CHECKER CAB productions and local restaurants. 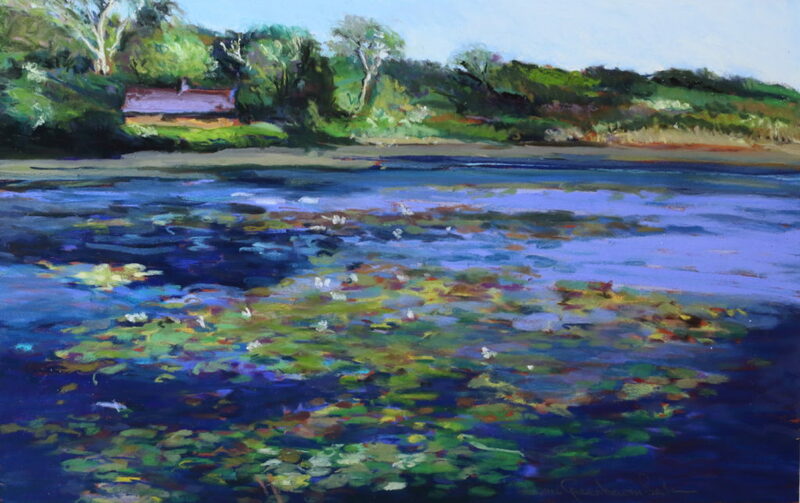 For Wilmington based artist, Laurie Greenbaum Beitch, painting is about the process of capturing the atmosphere and colors of serene and magical places. In her work, Laurie tries to evoke a mood, to create a feeling of light and of atmosphere by experimenting with different materials and techniques. Each of her gorgeous, velvety pastels are painted en plein air (the act of painting outdoors) so that she stays true to the location’s beauty, tranquility, and fragility. Join us for a special champagne toast and special reception for “The Joy of Plein Air” on Thursday, February 7th, 2019, 5:30-6:30pm. The reception is free and open to the public with complimentary champagne and appetizers. If you would like stay for dinner, please call 910-769-2972 for dinner reservations. Enjoy the Fine Art of Dining! PinPoint is located at 114 Market Street in Wilmington, NC. Dine at Platypus & Gnome Restaurant to view an enticing new exhibit of printmaking and drawing “Brayers, Brushes, and Color Pencils” by artist, David Norris, as part of our partnership with CHECKER CAB productions and local restaurants. Wilmington artist, David A. Norris, has a BFA degree from the East Carolina University School of Art. Long settled in the Port City, he finds limitless sources of artistic inspiration in the historic atmosphere of Wilmington, the natural beauty of the Cape Fear River, and the coast. David recently has created a series of monoprints that combine printing techniques with color pencils and lithograph crayons. They build on and complement a long-standing series of regional cityscapes and landscapes done in watercolor and color pencil. He also works in other media ranging from black and white pen drawings to silver point, scrimshaw, linoleum block prints, and collage. Join us for a special champagne toast and special reception for the artist on Thursday, March 14th from 6-8pm. The reception is free and open to the public with complimentary champagne and appetizers. If you would like to stay for dinner, please call 910-769-9300 for dinner reservations. Click here to view a selection of the work that will be shown at Platypus & Gnome. Platypus and Gnome is located at 9 South Front Street in Wilmington, NC.